The Lights and Sounds Racer™ offers fun, fast riding with lights and sounds at a great price! The trike's oversized front wheel feature Traction Tread™ to hug the road and allow your child to take off without slipping or spinning out. The electronic unit has seven buttons play ten different entertaining songs and sounds. It also has working turn signal lights for even more automotive fun. This sturdy plastic trike has a comfortable, low-back seat that is adjustable to grow with your child. 3 AAA batteries included. Click here to Like Radio Flyer on Facebook. 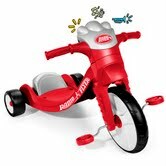 WIN: 24/7 MOMS and Radio Flyer are giving away a Lights and Sounds Racer. 1. Become a 24/7 MOMS subscriber enter your email address below and comment that you subscribed along with your email address. 2. If you are already a subscriber just leave a comment that you are a subscriber along with your email address. Like 24/7 MOMS on Facebook. Follow 24/7 MOMS on Twitter. Like Daily Mom Deal on Facebook. US entries only and one entry per person. Winner will be chosen on December 24, 2011. * We received a complimentary Radio Flyer Lights and Sounds Racer for review no financial compensation was received. I like 24/7 moms on facebook as Mary Monahan. I like Daily Mom Deal on facebook as Mary Monahan. follow on FB and email. New fan of Daily Mom Deal on Facebook. I'm a subscriber, and my email is in my profile. Thanks for the giveaway! I did this: Like 24/7 MOMS on Facebook. I did this: Like Daily Mom Deal on Facebook. I am a 24/7 MOMS subscriber. My e-mail is kingdomanious@yahoo.com.I like 24/7 MOMS on facebook and Daily Mom deal. I'm an email subscriber, thanks! I like 24/7 Moms on facebook (kellie conklin), thanks! I like Daily Mom Deal on facebook (kellie conklin), thanks! I'm a twitter follower (kellieconklin), thanks! I'm a subscriber on Facebook. I like 247 moms on FB. I like daily mom deal on FB.